When just having the shoes isn't enough, Nike is there to back you up with some unique matching hooks. When just having the shoes isn't enough, Nike is there to back you up with some unique matching hooks. If you plan on picking up the Poison Dart Frog "Easter" Nike Kobe VII this week, you may want to call your nearest House of Hoops or Niketown location and find out if they'll be carrying the matching AW77 & Elite Sock set. 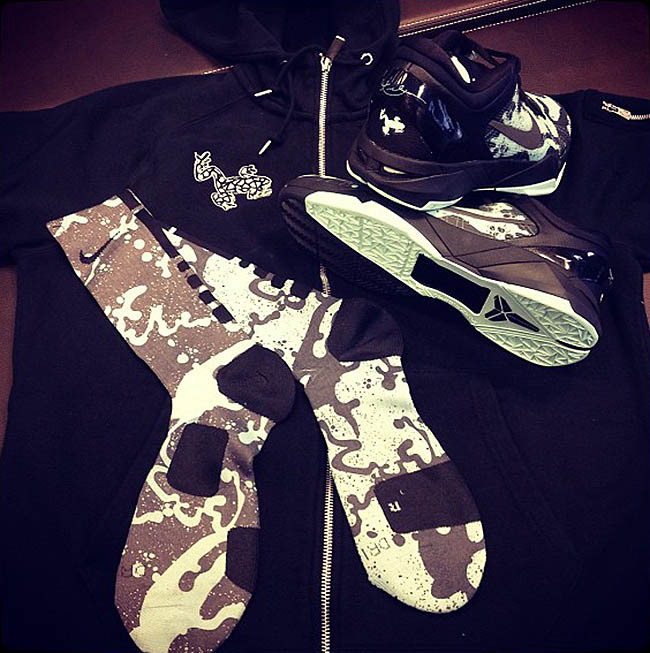 Pictured below, the hoodie is decked out in black with the Poison Dart Frog logo on the ride side of the chest, while the socks feature the unique Poison Dart Frog print seen throughout the upper of the shoe. No word on pricing yet, but look for the matching apparel at select spots when the "Easter" Kobe VII drops this Friday.